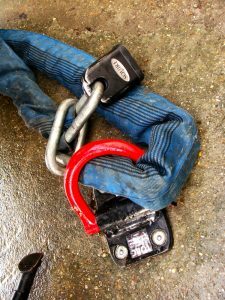 Thus the choice to use a disc lock that is easier to transport and still reasonably effective as a theft deterrent is appealing. For example, when touring and you’re already carrying tonnes of luggage, the last thing you want to pack is a huge chain as well. That and spotting this lock reduced on Amazon prime sealed the deal. 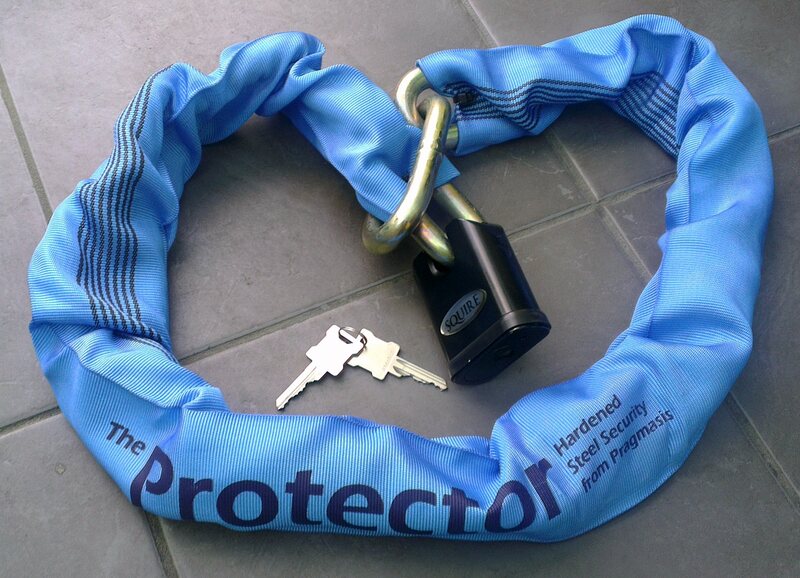 Last week when my wife tried to take her bike out she discovered the Squire padlock had seized, leaving it chained to the ground! Neither key would unlock, we tried dousing it in WD40, GT85 and Halfords Shock’n’Unlock spray, even after been left to soak for a day or two. We tried tapping it with a hammer, but nothing would make the key budge in the lock. Upon contacting Security For Bikes who we purchased it from, they informed us it was covered by a 10 year warranty and put us in touch with an engineer at Squire. They got back to very quickly with some advice, mostly what we had tried already, but as a last resort suggested applying pliers to the key to force the lock. This worked and the padlock opened, however it wouldn’t unlock again subsequently. As per Squire’s advice we sent it back for repair/replacement. 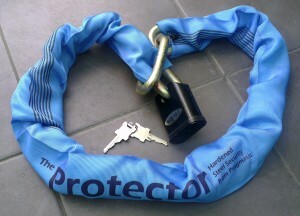 A couple of days later a brand new padlock arrived through the post with a cheque to refund us for postage. 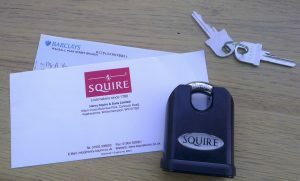 So, a big thumbs up goes to Squire, for their top customer service, prompt responses and a warranty that really is worth the paper it’s printed on. You can purchase a Henry Squire SS65CS padlock from Amazon here. 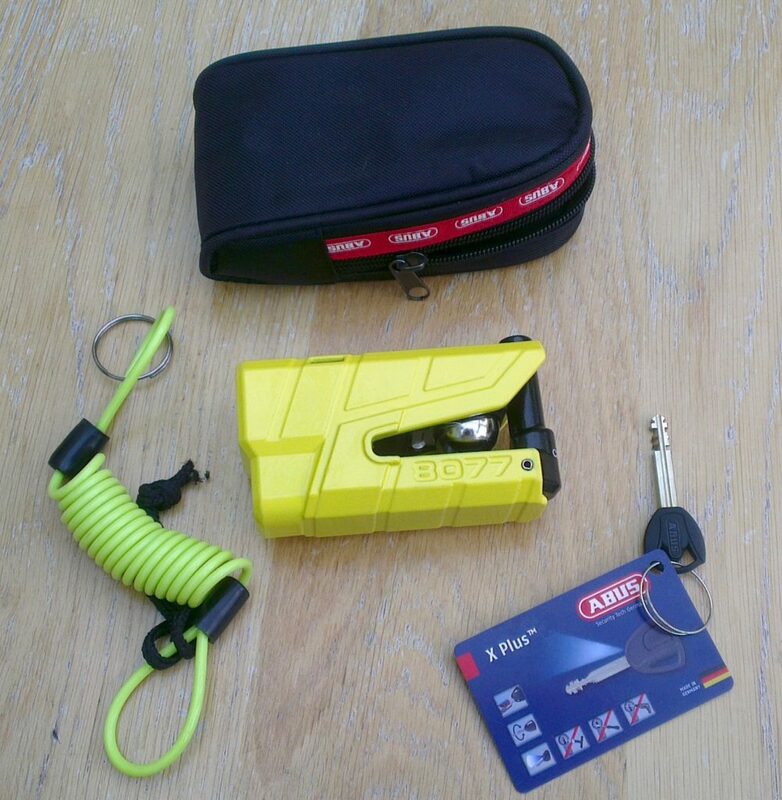 No one wants to lose a bike to thieves, so get clued up on the best security gear out there to protect your ride. Check out my new in depth article on Motorcycle Security Tips. Lots of details on all the best types of devices to use and info on the common attack thieves employ. Definitely valuable reading. 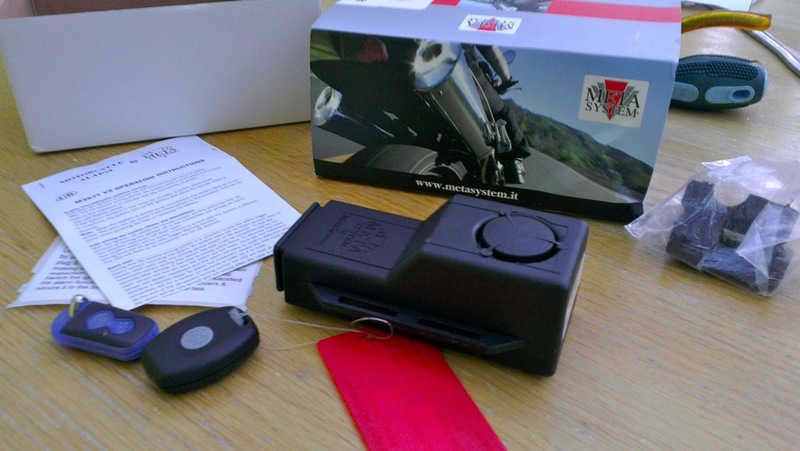 Last week the Meta M357T V2 alarm and immobiliser on my Fazer started playing up. It refused to make any sound when arming and disarming, just silent flashes of indicators. When deliberately triggering the alarm it remained silent and I just got hazard lights flashing. The immobiliser did however continue to work. Then later in the week, it started to make a noise again, just extremely quietly. Very odd. Obviously I kept my lack of alarm hush hush until I had remedied the situation. Reading up, it seems that after around 10 years the internal battery on these alarms starts to give up the ghost and causes these kinds of issues. I also came across accounts from those who left it and it deteriorated further to the extent they couldn’t disable the immobiliser – eeek! Bike security is essential in London. 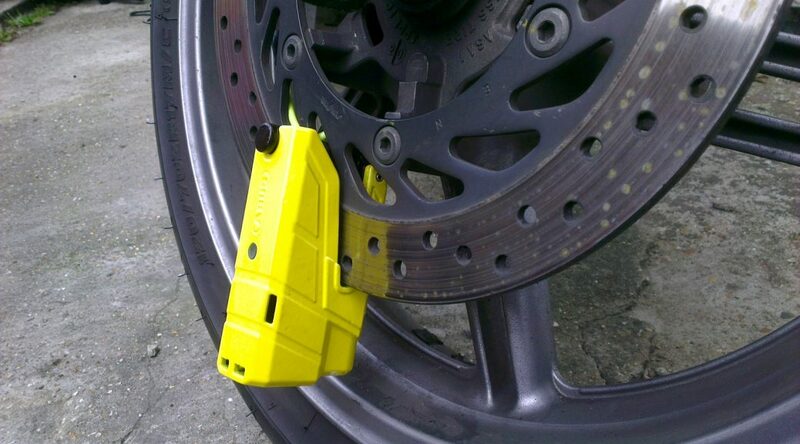 It’s a sad state of affairs, but bike crime is rife and only a fool would skimp on security. 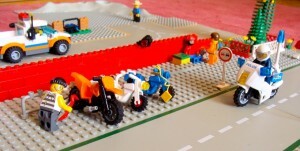 A good solid chain is one of the best measures you can take, but it is only as good as what you chain the bike to. Your chain should have at least 16mm thick links, anything less is a waste of time. As many would be thieves favour 42″ bolt cutters, which generally have a mouth that can only accommodate ~14mm chains. Even better, opt for a 19mm chain. The best brands out there are Almax and Pragmasis. Price wise there is little difference, however I opted with Pragmasis as their ground anchor appeared to have the edge slightly. The downside of these big chains is weight. Since I would be carrying the chain to work everyday, I opted for the 16mm chain, which at 2m and with lock, weighs in at about 15Kg!